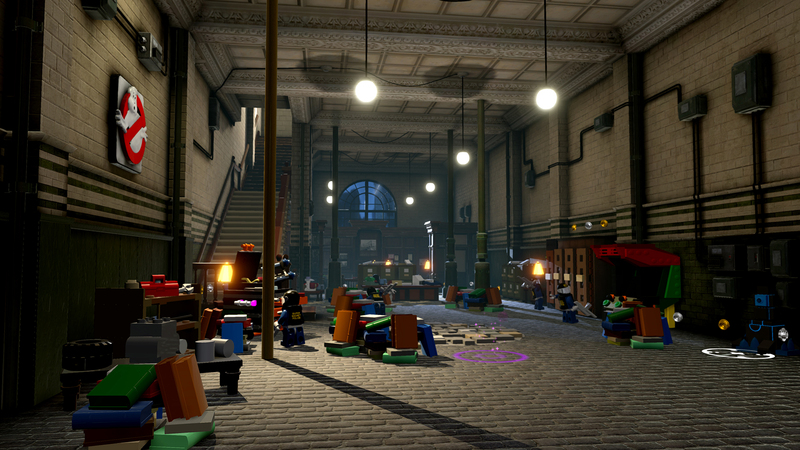 Towards the end of August Lego Dimensions gave ghostheads, LEGO fans, and gamers (good combo) a first look at the Lego Dimensions (Ecto-Containment blog post) Ghostbusters Firehouse. Above naturally is the street corner where Ghostbusters HQ is. Maybe the Lego Dimensions ECU was shut down as the lights aren’t really on and LEGO ghosts are escaping out of the building! Second image giving us an office point of view towards the garage bay. For some reason a LEGO Police officer is inside! Also note the “no ghost” logo Ghostbusters sign that’s also hanging on the wall. The game designers may have taken inspiration from the real Hook & Ladder 8 where a screen used Ghostbusters II sign hangs on a firehouse wall. Because a guy name Shaggy and his meddling dog just had to get into the Ghostbusters business, they get chased by ghosts. Real LEGO ghosts! Not ghosts who are really people wearing masks. Lego Dimensions will be available on September 27. 2015. Depending on the characters level and fun packs they’ll be available on September 27, throughout the rest of the year, and during 2016.